Oftentimes, people don’t think about estate planning until they’re married. But the reality is that estate planning is just as important — and in some instances more important — when you are in a relationship but not married and especially if you are not planning to be married. Here are eight reasons why estate planning is important for unmarried couples. 1. Giving Each Other the Right to Inherit: In many unmarried relationships, neither partner is entitled to inherit under the Colorado laws of intestacy. This means that if either of you dies without a will, all property that passes through probate will go to any current spouse, children of the deceased, parents of the deceased then siblings (that is a general summation). You’ll notice that romantic partner is not on this list. If you want to protect your partner, you need a will to do it. 2. Defining Whether You are Married: In Colorado, you may be “common law” married without even knowing it. This is an issue of fact in Colorado and a short consultation is the best way to go over the facts in your case. If you are at risk of being common law married without having the intention to be married, a cohabitation agreement is in order. Remember that if you are “married,” then you have rights to inherit. 3. Giving Non-Probate Assets: You need to go over your non-probate assets, such as jointly titled real estate, joint accounts, retirement accounts with beneficiaries, investment accounts with beneficiaries, pensions, etc. You can get to work on this right now by naming each other as beneficiaries (if you wish to do so), but there may be tax and other issues. You do not want to give away too much by titling improperly. Believe it or not, the Supreme Court of the United States addressed this issue this summer, determining that the property goes to the named beneficiary whether or not the deceased tried to change the beneficiary through a will. 4. Making the Right Probate Choices: Almost anyone who owns real estate will go through probate (unless is it titled jointly with a right of survivorship) and a will makes sense. Anyone who owns real estate out of state may need a trust to avoid having to go through probate twice. Some people may need to avoid probate entirely with a properly drafted trust. These options must be gone over on a case-by-case basis. 5. Medical and Financial Decision-Making if You are Incapacitated: Parties who want to protect their decision-making in the event of a medical issue should have a medical durable power of attorney, financial power of attorney and living will. This is especially the case where that party wants a partner who is not a spouse making decisions. Otherwise, that partner may be shut out of the process entirely. 6. Keeping You Safely Housed: What happens if either of you pass away and the partner is denied access to the home you share? This happens more often than you would think. Estate planning can protect against this. 7. Writing Documents That Hold Up Under the Law: Some parties try to address estate planning by writing their own wills using forms they downloaded or purchased from a website. I have yet to see an online form will done properly. On the other hand, properly drafted and witnessed documents give you the ability to protect each other in the event of incapacity or even death. A well-written document will include the ability to make gifts in a handwritten note, but any other changes must be properly sworn and witnessed. Lawyers have the ability to research, draw on their expertise, compare various forms with current law, consult with other experts and make sure the process and products are done correctly. 8. Your Unique Issues For Your Special Relationship and Protecting Children: In addition to all of the foregoing, if either of you has children from a prior relationship or the current relationship, you will want to protect them with estate planning. This is the case whether or not they are minors. Couples of the same gender may have additional legal issues. For example, in Colorado, they may have chosen a civil union in lieu of marriage. The law in this area is developing as Colorado comes into accord with recent Supreme Court requirements. All unmarried couples have special issues unique to them. It may take a face-to-fact consultation to identify and address them. 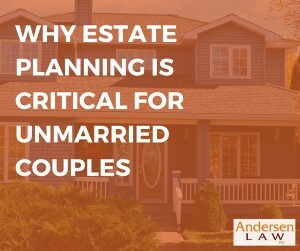 As a Littleton family law attorney who also does estate planning, I especially enjoy working with unmarried couples at Andersen Law PC because I know how critical this is. I do not want to see a partner shut out in the event of death when a simple set of documents could prevent it. Next Next post: Should a Small Business Owner Hire an Independent Contractor or Employee?